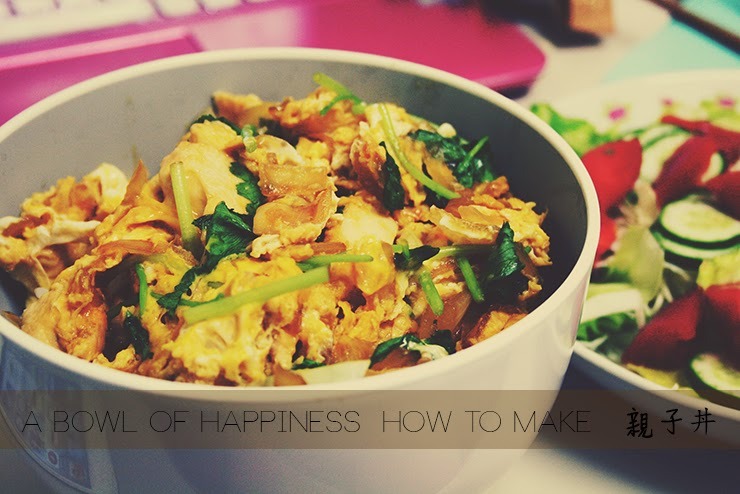 A BOWL OF HAPPINESS: HOW TO MAKE 親子丼 OYAKODON. Yesterday I made this very simple yet very intriguing dish that I love. The first time I tried this dish I didn't look up any specifics because come on - what can be so hard to make eggs with chicken? Well, apparently a lot can, since my dish failed bad that time. Some years older and wiser, I looked up how to make this dish properly and see - it turned out wonderful! It's not hard to make it - it's just tricky to get it right if you have no experience with Japanese cuisine. This dish I talk about is called Oyakodon - Oya, the parent and ko, the child, together in a bowl (don). It's a bowl of rice with a hot chicken-egg-mixture on top. (I always thought the child-parent name was painfully accurate - maybe a little bit too accurate for my tasting... but well.) There is a keyword for Japanese dishes that can be read anywhere. No matter where you go in Japan, and especially when it comes to chicken there is one crucial word: Juicy. The Japanese love juicy. Especially juicy chicken. 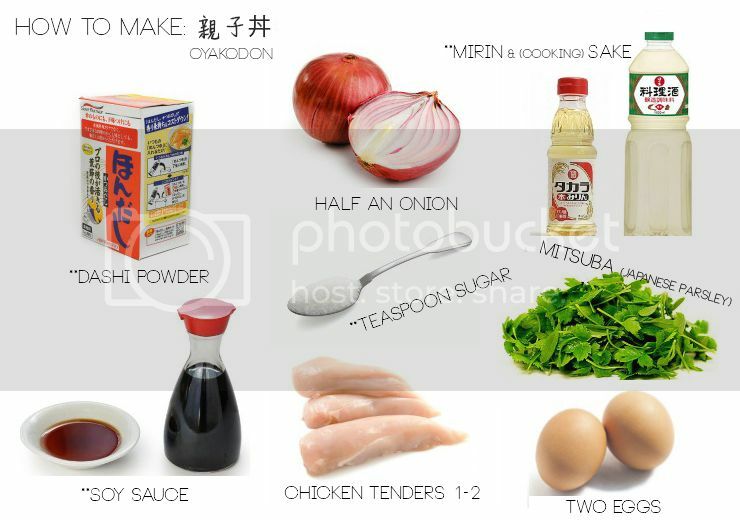 And the Japanese also mastered on how to make a dish with chicken without having it to be any dry at all. 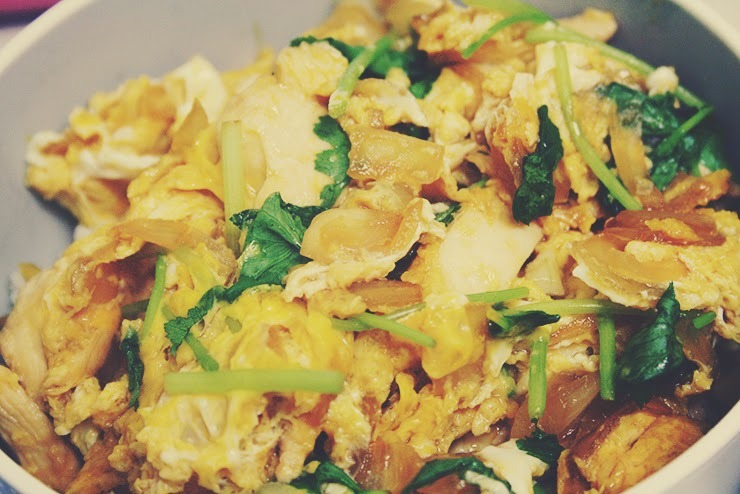 For me, Oyakodon is a bowl full of happiness: It is very easy and quick to make yet it somehow gives me a really melancholic feeling as if I'm home. It's hard to explain. Even if you might not have any feeling towards this dish (yet) you should totally try it out. 1. Prepare the stock: Mix the dashi powder with approx. 50ml water and give into a frypan. Add soysauce, mirin, sake and sugar, heat the pan and stir until sugar is combined. 2. Chop the onion in rough pieces and add to the stock in the pan. Close with a lid and let it simmer over medium heat for about 3 minutes. 3. Add the chicken and let it simmer for another 3-4 minutes with closed lid. Flip the chicken over and let it simmer for another 2 minutes. 4. Mix the two eggs together and give about half of the egg mixture into the pan. Stir lightly and let it set for about 30 seconds, then add the rest of the egg mixture. 5. Chop mitsuba in 1 inch pieces and add to the mixture in the pan. Close the lid, turn off the heat and let it sit for about 20 seconds. 6. 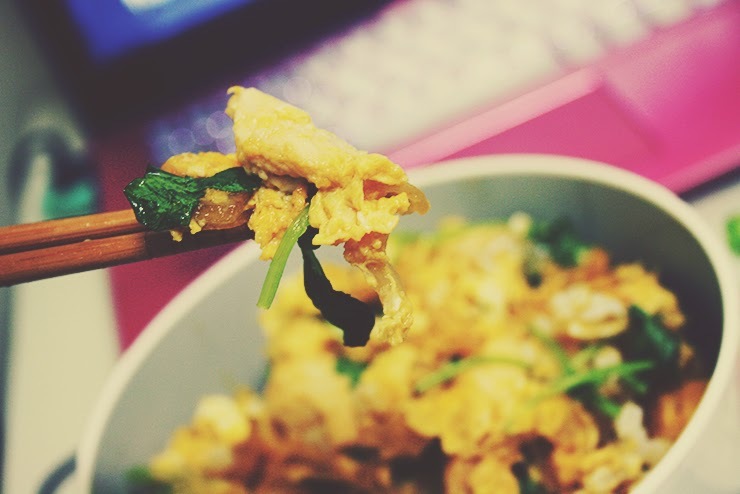 Put steamed rice into a bowl and add the chicken-egg-mixture on top. Enjoy! Crucial point: Do not overcook the eggs! If you cook them for a minute or longer they will completely stock which means you will end up having a really dry dish. I'm off to Yoyogi-Park in Tokyo now, have a nice weekend!